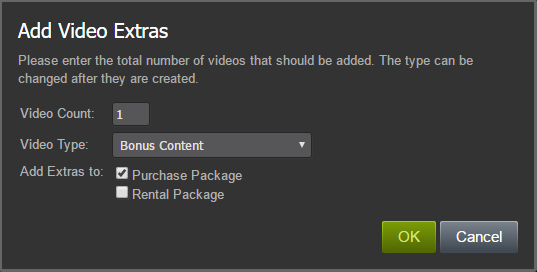 Video Extras on Steam provide support for what customers may know as "DVD Extras", that is bonus video content including Behind The Scenes, Deleted Scenes, Extended Scenes, etc. A Video Extra is delivered with the purchase (or rental as applicable) of a Feature Film or Video and are not available for individual purchase. Video Extras are displayed on the store page below the About This Video section displaying the capsule, title, running time and description. Below are step-by-step instructions for bringing your video extras to Steam as well as more details about how this content works on Steam. If you have any other questions, please post in the developer discussion forum and we'll be happy to share more! Once you've created the base Video App that represents the Feature Video, navigate to the Manage Video link on the Video App landing page. From the resulting Video tab, select Extras. You can begin to add extra content by then clicking the Create Extra Content button. A dialog will be displayed where you can enter the number of extra videos you have. You can add more later if needed. You can also set the type of extra content and determine which packages the extras should be added to. Click OK to create the extra content and begin uploading videos, entering metadata, etc. Note: Unlike a regular Video app, there are no additional packages created so make sure the videos are added to the Purchase and/or the Rental package otherwise you won't have access to preview the videos. For each video extra that you create, there is a small set of data that needs to be entered so that the video is shown correctly on the Steam Store. Header Capsule Image: Unlike the Featured Video App (and any other app on Steam), you only need to provide the Header Capsule image. If you don't provide an image, the Store will automatically use the appropriate image from the featured Video. It doesn't look as good but we also understand that not every extra will have art. If you have the capsule art, click the Choose File button or drag the image onto the file selector. When you click the Save button, the image will upload and a preview will be shown to you. Name:Give the extra a name. You don't need to put the featured video name in the title, Steam will do that automatically for you as needed. Type: If you need to adjust some of the extras to a different type, you can do that here. Running Time: Enter the length of time in minutes. Round down for less than :30, round up for greater than :30. Description: The description should be a short summary of the extra content (maximum of 300 characters). The text box size is approximately the amount of content that will show up on the Steam Store. If you have description in other languages, select the appropriate language from the drop down. Click Save to commit all the changes. This will update the underlying video app automatically (Store Page, Settings, Package names, etc.). Click Reset if you've made a horrible mistake and want to reset the video to the currently saved values. Now repeat for each video and you'll have the metadata entered for all the extras! To change the order of the extras, click the 4 horizontal lines near the extra header and drag the video to the new location. The extra number indicator will continue to show the original number until the page is refreshed. If you need to add extras after the initial Create Extra Content process, you can click the Add More Extras button below the list of existing extras. The same dialog as Create Extra Content will be displayed. Enter the number of extras to add and click OK.
Each extra needs a video file uploaded for ingestion into the video platform. This is the same ingestion process used for films and standalone video content. Click the Upload Video link shown next to the extra's metadata. A window will pop open to the Video Upload tab for the extra. Follow the instructions to upload a video to complete this step. Once the video has been processed (usually 1.5x - 2.0x the length of the video content), you can upload any subtitles or captions or define the languages for the video and audio tracks. Click the Subtitles, Captions, Languages link shown next to the extra's metadata. A window will pop open to the Video Management tab for the extra. Follow the instruction to configure a video to complete this step. Once an extra has metadata and the associated video file ingested, it is ready to be released. You will know it's ready to be released by looking at the Checklist state next to the extra's metadata. Once all the items are completed the Checklist state will update accordingly. If you believe you've completed all the steps but the Checklist remains as Not Done, click the Video Landing Page link next to the extra's metadata. That will pop open a window to the Video App landing page and you can review the checklist on the right-side to determine what isn't completed. Once you're ready to release one or more extras, click the Release Extras link. Each extra that is checklist complete (but isn't already released) will be shown in the Release Extras dialog. Select the set of extras you want to release using the checkboxes. Select the type of release using the Release State drop down. COMING SOON: This will set the extra into coming soon mode. You should only use this option if you are selling the feature video before it's available. RELEASED: This will set the extra into the released state so that owners of the extra content are able to watch it. Click OK to begin the release process. The dialog will indicate which extra is publishing and any errors that occur during publishing. This step will take about 1 minute per extra being released so please be patient. Video Extras appear in the Videos section of the Steam Client Library. Videos are automatically sorted based on the Featured video name. The order of the extras is maintained in the library. A customer can then select any individual extra to watch. Once an extra has been released, you are free to update the metadata, replace the video file, etc. Please be aware that clicking Save on an extra will cause that change to publish immediately and will take more time than saving metadata before release. If your Extra content requires country restrictions, please contact the Steam Business team to have those restrictions set before launching the Featured Video. When extras are released, the country restrictions are automatically applied from the Featured Video settings.